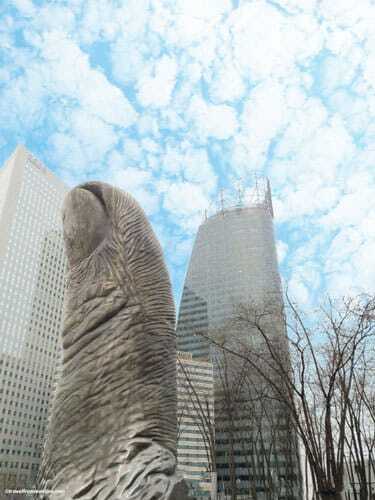 Le Pouce is a monumental sculpture representing the thumb of the sculptor César Baldaccini. You'll find it in La Défense district, on Place Carpeaux behind the CNIT tower and next to the Grande Arche de la Defense. César made the first cast of his thumb in 1965 for a Parisian art gallery on the occasion of an exhibition on the theme of the hand. This first thumb was 40cm high and was in pink translucent plastic. It raised 1.2 million euros at the International Contemporary Art Fair (FIAC). The huge success of this original work therefore encouraged César to reproduce his thumb in different sizes, colors and materials. The EPAD (Etablissement Public pour l’Aménagement de la Défense -public establishment for the development of La Défense) commissioned the sculptor with another Pouce. 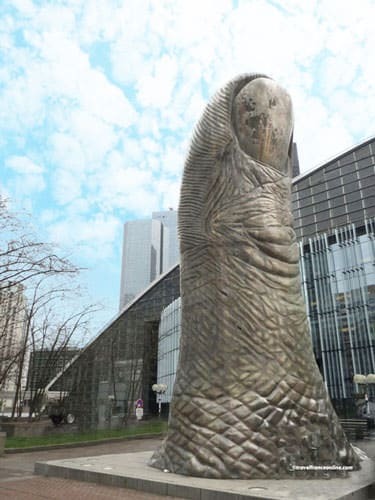 Le Pouce on Place Carpeaux is 12m high and weighs 18 tons. It is in cast iron and is the most massive of all the thumbs César produced. It was unveiled on June 16, 1994. César created this sculpture from an enlarged molding of his own thumb using the 3-D pantographic technique. The pantograph is an instrument that allows reproducing volumes at any scale while maintaining the proportions between the original and its copy. Indeed, the enlargement of the fingerprints and skin details is so precise that we clearly distinguish all the anatomical details of the thumb. Le Pouce de César represents only the finger's last two phalanges; it stands vertical and has an obvious phallic symbolism. But most of all, the thumb is the finger that allows us to grip; this power differentiates us from other animal species and therefore reflects our superiority. César Baldaccini (1921-1998) was commonly known by his first name. He considered himself as a Nouveau Realiste artist. This movement emerged in 1960 and took its roots in the Surrealist movement of the 1920s; it processed, recycled and transcended the nature of everyday objects. His friends, Jean Tinguely and his wife Nikki de Saint Phalle, joined him in this movement. One of their most famous art pieces is the Fontaine Stravinsky next door to the Centre Pompidou.